The Sawmill Creek Turf Blog: THE SUN IS HERE! Well after yet another wet week, the course is what some may call drenched. Call it what you will, but folks its wet out there. And of course, the turf is growing like crazy, which forces us to carry on with our maintenance practices. This in turn sure makes a mess of things. There are tire tracks all over, the mowers aren't cutting half as good as they can, but what can one do? However, seeing how today was one of the first warm (kind of) and pure sunny day we have had in quite some time, we were finally able to get out and verticut our greens. The reason we chose today to start this process, was to hopefully set us up for tomorrow, and apply our first topdressing of the season. I am sure that there will be the odd group who we may cause some delays or minor interruptions to during this process, but I ask that you please bear with us during these very important tasks. I understand it may be frustrating that we are out there performing some intrusive maintenance practices during some of the nicest days of the year so far, but please keep in mind that these are also the first days of the season in which the weather has cooperated with our need to perform such tasks. 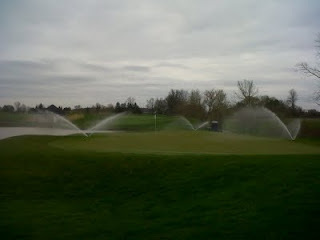 These maintenance tasks are crucial to ensuring great greens throughout the year. For those of you who have made a habit of visiting this blog, or of following me on Twitter, you will have noticed that I spent the day at the beautiful Essex Golf Club on Monday at the Can/Am Golf Superintendents event. Unfortunately, this proud Canadian had to represent the Michigan Golf Superintendents Association, and play for the US, and even more unfortunate is that I won my match and helped the US retain the Can/Am Cup...... sorry!! The point of the matter is, Essex was a beautiful golf club. The president of the Ontario Golf Superintendents Association (who also happens to be the Superintendent at Essex), made a great point about Superintendents attending these types of events. His point being that until you leave your own golf course, you will never learn a thing. Although I have never thought of it in these terms, I can whole-heartedly say he is right. It is a great thrill and pleasure for me to have played some of the golf courses I have over the past 15 years, and I know I have brought pieces of each back into my operations. Every where you go, you will find an innovative Superintendent, who has developed or found a different or more efficient way of doing some task. And let me tell you, there is not another profession out there like golf superintendents who are so open and passionate about sharing information for the betterment of the game. You can ask any Superintendent, anywhere in the world, at any time, and they will give you all of the information they have to help you out. It is a brotherhood to say the least, and one that I am proud to belong to. Just a quick reminder that we will be aerifying the putting surfaces starting the 23rd of May in the late afternoon. If the weather cooperates, the cleanup and topdressing process should be completed by the end of the week.